← What are the Best made US appliances? Have you ever considered buying home appliances online? If you answered yes, you’re not alone. With online shopping rising in popularity and common usage, consumers are seeing more items like microwave ovens, toasters, blenders and more being offered. But when it comes to large appliances, like refrigerators, washer-dryers and freezers, Americans are a bit more timid to try to make a purchase like that. Consumer Reports recently surveyed its readers if they’d bought any major appliances online. But only 11% said they’d bought a major appliance online. This low number is due to factors like shipping costs, installation needs upon arrival and general know-how in buying major home appliances online. Of course, shipping a refrigerator across the United States is a costly procedure, simply due to the weight of the appliance. But if you pay attention to online sites like Amazon.com and Walmart.com, you can take advantage of the immense inventory of each of these online retailers, and sometimes find great deals on major home appliances. Here are some ideas to consider for the next time you’re looking to buy online. Retailers often offer new refrigerators at special discounts at different times during the year. Major home appliance companies often introduce new models and want to sell their older inventory, For today’s savvy shoppers, timing is everything. Knowing when these bargains come about can result in savings of hundreds of dollars. 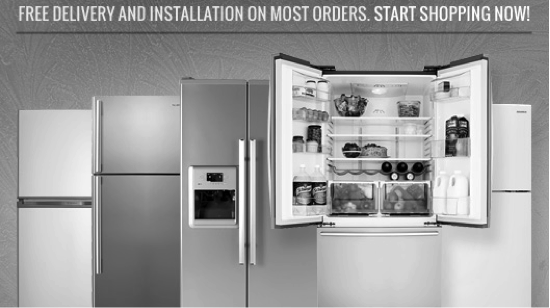 Most refrigerator manufacturers offer their new year models in the spring. So look for deals online by May and Memorial Day through June. Appliance retailers often try to hit sales quotas at the end of the month, so shopping at that time could result in saving money on new refrigerators. Shopping on Thursdays is known in appliance industry circles as a good day to find bargains. Did you know that even using different Internet browsers can offer up extra savings? Checking appliance prices online can yield different prices on Chrome or Safari than Internet Explorer. Buying from a major appliance retailer? Some stores may offer extra discounts when you fill out an application for a credit card on their site. Appliance replacement businesses often have knowledge of which manufacturer is able to offer deeply discounted appliances. Check with your local appliance replacement service company about any refrigerator deals you might find online (or locally!) to save you money. If shopping for a new refrigerator is not in the cards for you or your budget is less than anticipated, chances are that your existing model may need replacement parts down the line. For the right part at the right price, contact Appliance Parts Company. We are an authorized Internet seller of factory-certified replacement parts for water filter systems from major appliance makers Whirlpool, Maytag, Kitchen-Aid, and Jenn-Air. Our knowledgeable staff can provide replacement appliance parts online, by mail or through our 12 Southwest USA stores across Arizona, Nevada, and Texas. This entry was posted in Appliance Repair Parts and tagged buying large appliances online, kitchen appliances, refrigerators, replacement appliance parts, replacement parts for appliances. Bookmark the permalink.